1 photograph : b & w. ; 17 x 22 cm. 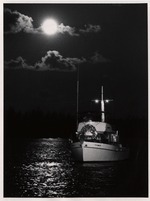 A full moon illuminates a cabin cruiser decorated with an image of Our Lady of Charity of Cobre on the bow. Original caption: Moon and Saint at Marine Stadium. Photo date stamped on verso: September 9, 1976. Cite as Miami News Collection, HistoryMiami, 1995-277-3105.